Discussion in 'GS Boxers' started by Schtum, Jul 30, 2014. Time for a new one... how many miles on it? Read post #614, on page 41.
riding WV roads, I'm surprised the sides aren't worn more..
From this thread, it looks like most of the people who report problems are on the GSW which uses a different size. Maybe that's it? See my previous post #592. I'm on a 2012 GS. Same issue. When it's down flush with the bar. Federal Motor Vehicle Safety Standards require that tires be manufactured with tire wear bars. 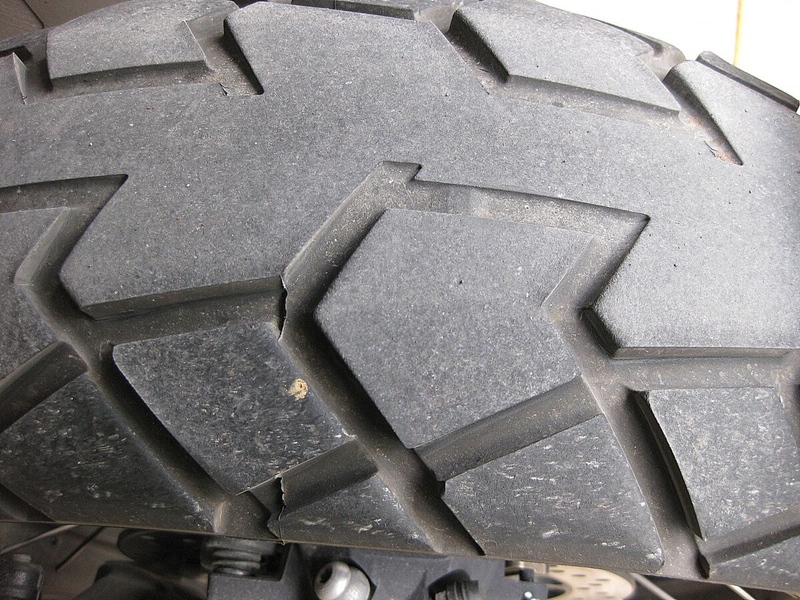 Most tires have at least six or more tread wear bars. Some small tires (12-inch rim or smaller) only require a minimum of three tread wear indicators. Each tire wear indicator on a tire provides a visual indication of whether the tread is worn to 2/32&#8243;. When you visually inspect one of your tires, find a tire wear bar and see if it is flush with the rest of the tire's tread. If so, your tire is worn to 2/32&#8243;, and you need to replace it as soon as possible. Thanks, i have 7500 miles on mine and and getting close but not touching yet. Just back from a ride to Inuvik and back. 3 bikes all with TKC80 on front and TKC70 on rear..a 2013 GS and 2 2014 GSA, loaded with gear. The Dempster had everything, some wet dirt, some icky calcium chloride, rocks and gravel. I had 2 rock punctures creating slow leaks, plugged on roadside and repaired with internal patches when convenient. No other issues with any of the 6 tires. Greg and Mark rode from Los Angeles and put about 7500 miles on these tires. Still good life left in the front TKC80, the rear TKC70 is worn out. We also rode some back roads before and after the Dempster, and this combination of tire was just right for what we did. We saw several other riders with similar combinations. Tire pressure 36/42 on pavement, 4-5 lbs less on dirt. No high speed weave or wobble with that combo? Thinking about doing the same. In Newfoundland tonight. I rode the TKC-70's up from Georgia through heavy rains and then the Trans-Lab Highway. Down to Newfoundland and around the island. The tires at first were twitchy for maybe 250 miles but they settled down and were solid. They handled the east coast storms with no problems. Once in the dirt and gravel I had no real issues either and after reducing pressure they rode great. I have almost 4000 miles on them now and they are just now showing signs of real wear. I will post more when better internet is available. TKC70 both front and rear? Thanks. That is encouraging. I have a set in the garage that is waiting on me. I now have about 3500km on my set of TKC-70's. Mounted on a 2014 R1200GS LC, balanced at the dealer with Ride-On added when I got home. Running a little higher pressures then factory (I am a big guy) 37-44 psi f/r. 50/50 gravel/pavement. I have noticed no abnormal wear on the front or high speed wandering, though I have noticed at about 130km/hr the front feels a bit light and a bit more susceptible to cross winds, however this is very slight. As the distance increased, the bike seems to fall into corners a bit more readily. The grip is fantastic on pavement and way better than my previous A3's on gravel. The rear hooks up in mud quite well, and the front tracks better in the soft stuff. Not a lot of rain to report, but the few times performed well on wet pavement. The wear seems good at this point with the rear flattening out slightly. I have been running the TKC70 both front and rear for the last ~11000 miles. Happy with the performance so far (all tarmac). I am concerned with the wear on the front tire. Can anyone shed some insight about what is going on here? Can you perhaps repost and highlight what you're referring to? I'm not seeing anything concerning. The front wedges are wearing unevenly with scalloping of the tread pattern. This actually happens on a number of different tire makes. I have had this happen on Anakee Two's. The TKC70 seems to be a little more prone to uneven wear, which might be a factor of incorrect tire pressures. I am not seeing anything along the lines of this. It looks strange to me and I would contact Conti for guidance. Yep. The "cupping" was pretty bad on Anakee II's at around 6k miles. Lots of legal tread left, but I always replaced them by 7k miles or so because the traction wasn't as good when leaned over and riding hard. Still loved the tire, and used 4 of them. I've never seen cracking like that, and that would concern me about safety, rather than reduced performance from cupping.